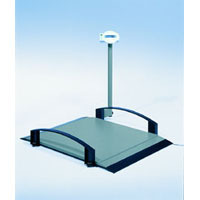 Bringing intelligence to bear : This innovation illustrates the new generation of seca 664 wheelchair scales.Equipped with the Smartcard station, this scale is capable of storing and recognising different wheelchair weights. When a person is weighed in a wheelchair and the Smardcard is used, the station automatically subtracts the weight of the wheelchair in question. Only the patient's weight appears in the display. The Smartcard can be kept on the wheelchair itself in a card holder. Using as many cards as you wish, it is then possible to take the different weights of different wheelchair into account. Six cards and six card holders are supplied. Of course this functionally extended model also advantages and functions of the seca 664.